RIR takes a look at the life of a controversial yet dynamic musician, who was fascinated with Hindu and Buddhist philosophies, and has often been called the Bob Dylan of Russia. When it comes to Russian rock legends, one name stands out- Boris Grebenshchikov. The leader of the band Akvarium experimented with the Beatles style in the 1970s, sang in a choir of Shaolin monks in the 80s and even became fascinated with Indian ragas. “I was born at the Customs — when I dropped out on the floor. My dad was a smuggler, My second dad was Interpol”- this was one way Grebenshchikov mythologized his origins in a song. In reality everything was very much down-to-earth. He was born in Leningrad in 1953 to an engineer and a fashion artist. In the USSR of the 1950s it was a common for young people to put their tape recorder up on the window-sill and share their favourite tunes with the whole neighbourhood. Grebenshchikov loved this ritual as a child and that's where his passion for music originated. In his early school years he started writing poetry and novels. Over time his two passions became one. Boris found his first guitar in the trash container. After having it repaired and buying strings, young BG (Grebenshchikov's nickname given by fans) started playing his first chords. Skipping musical school, he became self-taught. He listened to Vysotsky and Galich, figuring out the tunes and began composing his own - just like Bob Dylan. In school, BG got together with a few like-minded children to tape songs from a secretly tuned American Radio Liberty and to play music. It was these young outlaws that eventually grew into the band Akvarium. After graduating from high school BG became a student of Applied Mathematics, although this didn't affect his occupation in any way. “I had great time at the university, doing nothing but music. Once in a while integrals came to me in my nightmares,” he said. In 1972, Akvarium was born. After graduating from the university, Grebenshchikov stayed to work in the science institute, although he still preferred musical experiments to scientific ones. Akvarium's early records began to circulate in the underground. The avant-garde sound (noises, wheezing, homemade sound effects) and intricate absurdist lyrics immediately captured the minds and hearts of the intelligentsia of Leningrad. In 1981, the band recorded the ‘Blue’ Album, where sound has become clearer, and the lyrics deeper. The album reflects the influence of Bob Dylan and Bob Marley. Soon Grebenshchikov himself was nicknamed Bob. Following ‘Blue,’ the band recorded several cult songs. ‘Radio Africa’ was an album with the broadest range of songs, uniting rock, jazz, reggae and even a choir of Shaolin monks. This album's top hit – ‘Rock 'n' roll is dead, but I'm not yet’ became the anthem of Russian rock music. Akvarium concerts became jam-packed. In tune with the collapse of the Soviet Union in late 80s, Grebenschikov wrote the song ‘Train on fire,’ influenced by Bob Dylan's famous ‘This Wheel's on Fire.’ The song immediately became the proclaimed anthem of Perestroika bringing the band country-wide fame. At his concerts the audience greeted Grebenshchikov as if it was he who was bringing down the USSR. In 1988, invited by Dave Stewart, the producer and musician of Eurythmics, Grebenshchikov travelled to the United States for recording his English-language album titled ‘Radio Silence.’ The album turned out to be totally different from Akvarium’s earlier recordings. The songs sounded more like Western rock of late 1980s. Yet the main accomplishment of this trip was the exchange of experience with the Western music legends Mick Jagger, Bob Dylan, David Bowie and George Harrison. Harrison had a particular influence on Grebenshchikov. While Jagger and Bowie were BG's music heroes, The Beatle was also his spiritual guide. Following his example, in the 1990s Grebenshchikov went to Hindu and Buddhist monasteries, the journey that resulted in new meanings in the lyrics and meditative themes in the music. 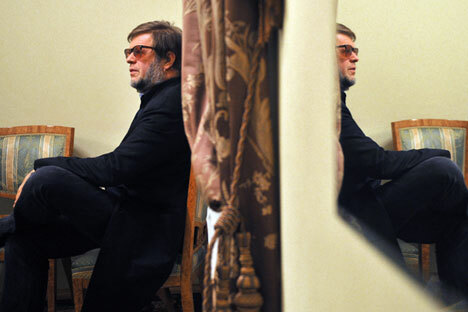 In the 1990s and 2000s Grebenshchikov travelled a lot, which is strongly reflected in Akvarium's lyrics and sound. The chaos of various musical styles and different cultures creates absurdist hymns, reconciling all. Bards intertwined with folk and punk-rock punctuated with Sanskrit mantras. Some album covers even feature Hindu elephant god Ganesha. Two years ago, Akvarium celebrated its 40th anniversary; however the musicians celebrated their anniversary as a 4000-year jubilee. According to Grebenshchikov this is how many years the group has been if not literally, spiritually protecting the world's harmony. Last year, BG celebrated his earthy 60 years. He is still very true to himself, releasing new albums and touring the world.